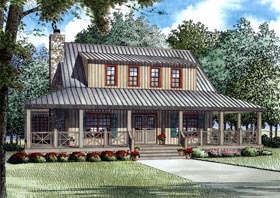 You’re sure to enjoy the wrap around porch that nearly circles this entire home. The Great Room invites you in with a warm fireplace and plenty of room that opens to the Dining Room and Kitchen. Entertaining is made easy with the kitchen’s eat-at island prep bar. There are also 2 bedrooms on the first floor that share a bathroom. Upstairs you’ll find a sleeping loft that overlooks the Great Room, and guests will find comfort with a another bedroom and its private bathroom. There’s also ample storage space.